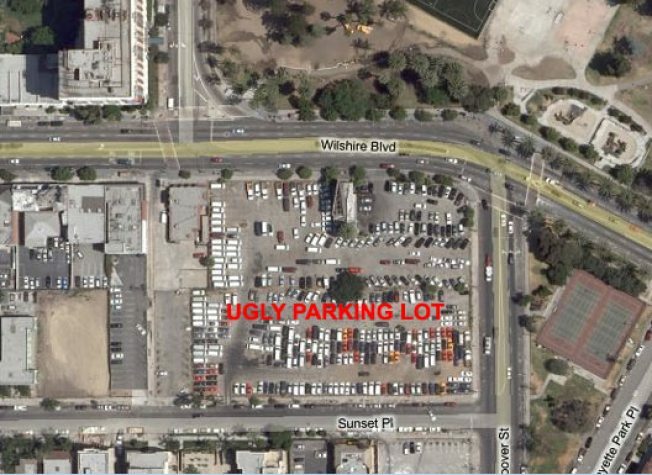 Last year, a reader asked about the future of the big ugly parking lot at the southwest corner of Wilshire and Hoover Street, across from LaFayette Park. Today, we got our answer. We spoke with a member of the development team who indicated that there are plans for a 200,000 square foot, four-story shopping center on the site - sort of in the mold of the proposed vertical shopping center at Wilshire and Vermont. The tenant mix is undecided at this point and its way too early in the process to guess on a groundbreaking/opening date. But still... a new mall!